When it comes to increasing your child’s chances of being wealthy, one of the best ways is to teach them about the value of money from a young age, as Patrick Dwyer Financial Advisor would agree. There are important lessons that can be imparted to children from a very young age about savings, the cost of things, and earnings. Here are just of the ways that you can ensure that your child is financially literate. Your very young child does not need to understand interest rates, bank accounts or investments strategies. Instead, ensure that your child has an understand of things like the value of things, the concept of exchanging things (including labor) for money, and the reality of limited resources. A young child is capable of understanding all of these concepts if they are explained in familiar terms and modeled appropriately. For example, you can take advantage of opportunities to explain the difference between a gift, something that has been lent (and must be returned), and something that has been purchased. You can also introduce the concept of working in exchange for money, and the reality that the things we want cost money. When you make purchases, you can explain to your child that you have to give money in exchange. At this age, you may want to help your child visualize the relationship between wants and resources by setting up a money jar filled with coins. When your child wants something special, you can physically remove an appropriate amount of coins from the jar so that your child can observe the fact that a choice to spend money on one thing leaves less for other things. Explain to your child the different ways that he or she could replace those coins, and what will ultimately be the result if they are not replaced. The piggy bank remains an excellent way for children to build on their understanding of money having an exchange value by introducing the notion of deferred spending, and of saving for things that they may want to purchase. Piggy banks give a child a visual and tangible way to appreciate that their savings are growing, and to understand that every time they make a decision to put their coins in the piggy bank rather than spending it on a treat, their savings are growing. 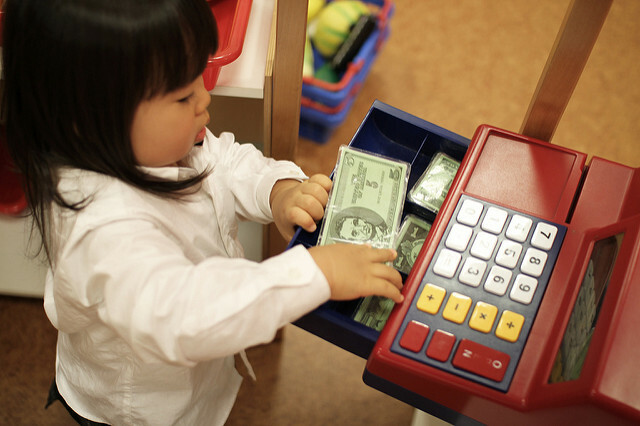 Once a child is old enough, he or she should have a savings account opened in their name. This will reinforce the idea of savings as a more abstract concept, ie., that isn’t tied to the money they have physically accumulated in their piggy banks. It also provides an opportunity to begin a conversation about interest rates. Explain to them that when they deposit their money in a bank, the bank will borrow that money to do other things with it, and will “pay” the child for that loan. In this way, the child can begin to understand that saved money can make more money. This provides a way to open a conversation about investments; when appropriate, encourage your child to purchase a savings bond to reinforce the idea that they can make their savings earn money. These are just some of the ways that you can help your child become financially literate. Be sure to reinforce these lessons by having regular discussions about money, about needs vs wants, and about the need to make choices based on limited resources.